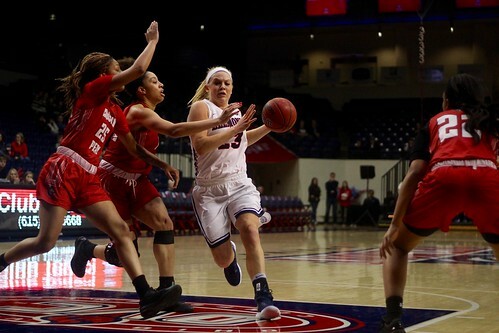 The Belmont women’s basketball team pushed to 8-0 in conference play, narrowly topping Austin Peay 78-75 in a hard-fought battle at the Curb Event Center Saturday afternoon. The Bruins’ eight-point lead just seven minutes into the first quarter — the largest lead held by either team during the game — was quickly erased by the visiting Governors. The two teams traded scoring control for most of the game, with Austin Peay outscoring the Bruins in the second and fourth quarters. Belmont, thanks to an explosive 24-point performance from junior guard Darby Maggard, and double digit scoring from junior forward Ellie Harmeyer (17) and senior guard Sierra Jones (14), finished the game on top. The Bruins will return to the Curb Event Center on Thursday for another conference matchup against Eastern Illinois.